Tickle My Senses: Mangalorean Fish Curry with Coconut. This is another tasty traditional Mangalorean fish curry which goes well with fish like sardine, herring and mackeral that have a strong fishy taste. This sour and spicy preparation brings out the best flavours in this type of fish. If possible, serve hot the next day with plain rice, vegetable and pickle as flavours improve with time. Garlic flakes sliced: 4 large. 1. Clean and gut the fish. Cut fish into curry size pieces, if using sardines, leave whole. Make slits along fish body to allow flavours to penetrate. Pour 1 tbsp vinegar and sprinkle salt over fish. Rub gently into fish. Leave aside for 10 minutes. This step helps to reduce the fishy smell in the fish. 2. Grind the masala ingredients to a fine paste using 1/4 to half cup water /as required. 3. In a large thick bottomed vessel place the ground masala and add in 2 cups of masala water/ more or less as required. Bring to boil, add all the slicings, vinegar and salt to taste. Close the vessel and allow slicings to cook on medium flame for 5 minutes or more till they soften. 4. 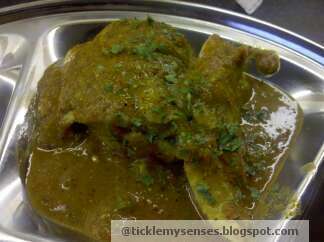 Now gently place the fish flat in the curry in a single layer, and cook covered till the fish is done (10-12 minutes) . Do not overcook the fish. The fish flesh will turn white, opaque and firm- up when cooked. Do not use a spoon to move the fish around, simply turn vessel gently in a circular motion to move curry over the fish. 5. Taste again for salt and sourness, add salt/ vinegar as required. 6. For seasoning: In a small pan heat coconut oil to smoking, add curry leaves, once leaves are fried and aromatic pour over fish curry. Fish Curry is ready. If you can resist serve hot the next day with plain rice, vegetable and pickle. Great, we just made it and it turned out to be one of the best coastal Indian recipes. I was leafing through your blog posts for some tasty fish curries. And I have a general question. Sometimes without roasting the spices the curry tastes bitter and quite raw (including onion and garlic)and some other times it tastes ok. I observed this particular curry neither asks for roasted spices nor masala frying after grinding. Would you please tell me why the raw taste comes otherwise in some curries/fish curries. Thank you for sharing tasty recipes. In my experience one of the most common reasons a curry tastes bitter is when the masala contains ground raw onions or too much methi( fenugreek seeds). To avoid this either fry sliced onions till translucent in a little oil before grinding or fry the ground masala well in sufficient oil. Mangalorean coconut fish curries is of two types. One where the raw ground masala is mixed with water and then boiled before adding slicings and fish as in this recipe. The curry has stronger, more pungent flavour. The same masala when fried well in oil before adding water gives a more mellow and rounded flavour to the curry.